A vacancy has opened up on the board of the Cairngorms National Park Authority (CNPA). Nominations are now being sought for a by-election to appoint a new member to the board of the Cairngorms National Park Authority (CNPA). Opening for submissions tomorrow (Thursday), the deadline for candidates is Thursday, February 23. Triggered by the resignation of Katrina Farquhar, the vacancy is for Ward 5 which covers Deeside, Glenshee and the Angus areas of the national park. The authority safeguard’s the area’s outstanding landscapes, rich habitats, rare wildlife as well as its communities while helping to develop a sustainable economy. The board also agrees the long term objectives for the park and set out priorities for work and represents the park and Authority by acting as ambassadors. Grant Moir, CNPA chief executive, said: “As staff, we look to the board for guidance and strategic direction and members will be involved with a number of committees helping to deliver the Park Authority’s three main areas of work - conservation, visitor experience and rural development. All registered voters in Ward 5 over the age of 16 will receive their postal votes around March 8 with votes to be returned by 4pm on Thursday, March 30. Further information on how to stand and on the nomination process is available on Aberdeenshire Council’s website at https://www.aberdeenshire.gov.uk/council-and-democracy/elections/cairngorm-national-park-authority-by-election/. 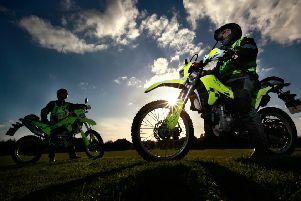 Off-road dirt bikes illegal use of a local estate are to be the subject of increased police patrols.